Verdict - A fast paced movie with a decent story. Mumbai Mirror is a cop-gangster movie set in Mumbai. It's a pretty decent watch as such. The story is fast with well paced action sequences and the cop hero has more than his share of shades of grey. The hero Inspector Abhijit Patil is a bit of a hero in the department. He gets the baddies but is also not averse to wine, women and drugs. He has an on off relationship with a gangster 's moll (and a typical 70s one at that, with low cut shiny gowns etc). 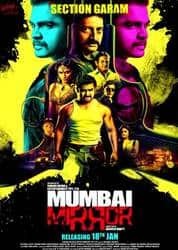 He takes on a panga with the gangster who runs all the bars in Mumbai and then finds out that there is much more to the man than just dance bars. He also runs up cricket gambling debts and develops a cocaine habit along the way . The story picks up all these strands, throws in some domestic violence and churns up everything to give you quite an absorbing tale. The end is predictably cynical and a bit hilarious in the pat way it concludes stuff but it isn't illogical, so it's fine. Sachin Joshi as the Inspector is quite dynamic. He has piercing eyes. However, his voice is too high pitched and though he boasts a six pack, lacks the physical presence. Plus, the Dabanng hangover,(including in the dance steps and dialogues) does not help him. The ensemble cast of other cops is excellent. Prakash Raj glides through the villain's role. Then ony irritating person is the journalist heroine who is too coy and simpering for my taste. The songs are superfluous and the item numbers tacky. They could have been avoided. Overall, though as my friend Hemant B pointed out, though the movie brings nothing new to the table, it still was an entertaining watch. See it if you like cop stories.